1. Even if you have done so already, watch the speech. 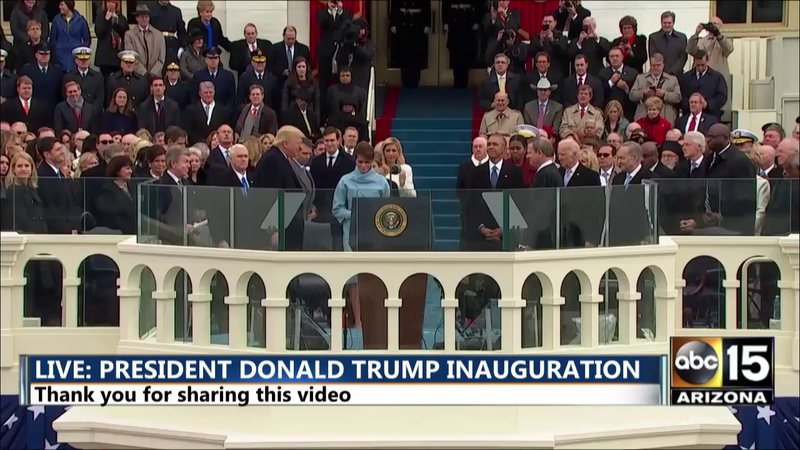 (Read it above or at whitehouse.gov/inaugural-address.) Who was President Trump speaking to in his address: Congress or the American people? 2. List at least 3 promises President Trump made in his address. Which is heartening to you? Are any of these promises disheartening to you? Explain your answers. 3. a) In his speech, President Trump said: "At the center of this movement is a crucial conviction: that a nation exists to serve its citizens." Do you agree with his assertion? Explain your answer. 4. What did President Trump say in his address regarding national unity? 5. Tone is the attitude a speaker takes toward his subject. What tone did Donald Trump take in his inauguration speech on Friday? (optimistic, hopeful, enthusiastic, solemn, inspiring, negative, hopeless, complaining? …) Explain your answer. 6. a) What did you see as the main focus of President Trump’s speech? From The Washington Post: "In his dark 'America First' inaugural speech, Trump has a message for ..."
From the Los Angeles Times: "In his first speech as president, Trump's vision of America remains dark"
From The New York Times: "The 'Dark Knight' Inauguration"
From the New York Daily News: "Trump leads U.S. into darkness, blames Obama in inaugural speech ..."
From QZ: Trump inauguration: "A dark, threatening first speech as president ..."
From The New Yorker: "Donald Trump's Dark Inauguration"
From Variety: "TV Anchors Take Wary View of Trump Inauguration Speech"
From The Boston Globe: "Trump's dark vision of America"
From the Hollywood Reporter: "'Divisive,' 'Militant' and 'Dark' Speech"
After reading and listening to his speech, do you agree with the media’s interpretation of President Trump’s inaugural address? Explain your answer. c) If a person did not watch or listen to the speech him/herself, do you think the media's interpretation of the speech would affect his/her outlook on the new president? Explain your answer.